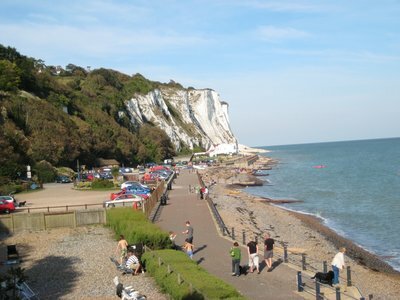 In Dover, the cliffs are white. The cliffs, massive walls of chalk, rise up straight from the grey-blue waters of the English Channel. This massive wall stands at the closest point to continental Europe, just 22 miles from the coast of France, and has for the last millennium kept all invaders from English soil. More important than physical defence, though, is the emotional place that the white cliffs have in the geography of the English psyche. In the days before planes flew vacationers back and forth from Mallorca and trains sped under the Channel, an Englishman returning home in Europe would most likely get his first glimpse of his homeland on a ferry from Calais, and the first thing he would see was those white cliffs. 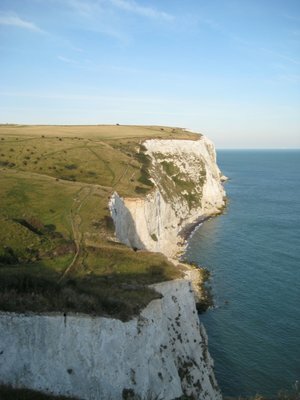 For England, the white cliffs symbolize home. I’d been wanting to see the white cliffs since arriving in London. A psychologist might suggest it is to fill an emotional need upon returning to the land of my ancestors, that I need to see this symbol of home to find my place here in my ancient and current home. I would probably counter that I just thought it was cool. Either way, after a week of watching depressing reports on the BCC about how the Lehman Brother’s collapse, the take-over of the Halifax Bank of Scotland, the falling stock market and the general depression in the square mile was likely to cause ripple effects across the economy, I felt like getting away. While the job hunt seems to be picking up, with more and more job postings appearing and more calls from recruiters, all this talk of recession, record breaking stock-market machinations and comparisons to the depression of the 1930s had me a little gloomy. I decided not to let this rather bad news about the destination deter me from my visit. That, and it was too late to cancel my B&B reservation, so unless I wanted to write off £34, I was going to Dover. Waking up on Saturday morning to a beautiful and sunny day, my spirit of adventure was restored. I checked my South-Eastern schedule one last time, and made my way to London Bridge station to catch the train to Dover. At London Bridge, I passed by the long line for tickets and bought mine from an automated ticket machine, feeling quite smug as I skipped by the suckers in line waiting to talk to a person, my tickets in hand. Looking up at the electronic departures board wiped the smug smile from my face. “Dover - See Posters,” it said. Normally where the destination was followed by a platform number so you knew where the next train to your destination was going. Instead I got a message to look at a piece of paper. I walked over to the posters listing all the departures, my roller bag trailing behind me. I tried to make sense of the long list of numbers and notations, but couldn’t quite make out what it was trying to tell me. Next I wandered over to the route map and stared blankly at that for a few minutes, hoping that it might hold some clues for me, but the more I looked at it the more it just became blurry blue, red and purple lines on a white background. I consulted one of the station workers who announced rather definitively platform 5 without consulting anything. “Hmm, must be a smart guy to have memorized all the train schedules and platforms,” I thought to myself as I wandered over to platform 5. The signs at platform 5 showing the next trains departing from there didn’t mention anything about Dover, however. Trains heading to Gravesend and Gillingham, but no Dover. I tried staring at the destination posters and route maps again, hoping that they might somehow make more sense now that I was at the other side of the station, but to no avail. After 10 minutes of trying to independently figure out where I was going, I swallowed my pride and consulted another station worker. Just to make sure, I looked up at the name on the platform. 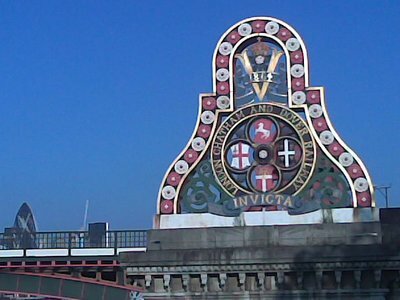 London Bridge. “Right, does it stop here,” I asked. So I found myself catching a train that travelled for 3 minutes closer to the centre London, just to catch a train back in other direction. 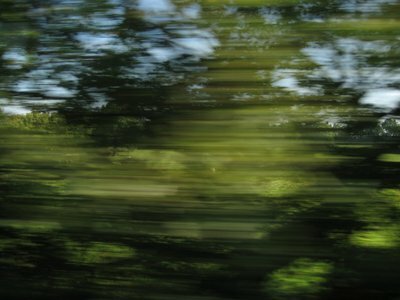 Soon we cleared Waterloo East station and were chugging along to the south-eastern coast of England. I felt immediately better as the train started moving. At first I thought it was just relief after the mix ups between me and train schedule, but then it sunk in that it was something more. Partly it felt good to be doing something productive with an immediate pay off, even if that productivity is simply a small bit of tourism. Job hunting is hard work, and while I know all the surfing the internet job sites, updating and emailing CVs to recruiters and getting dressed up for interviews is all leading someplace (hopefully to a job), it can feel like a Sisyphean task. A lot of action and energy expended without any results. Going to Dover and seeing the cliffs was a small thing, but it was something I had wanted to do in the U.K., so it felt like I was accomplishing something. More than just feeling productive though, it felt good to be on the move to somewhere new. I realized that I actually quite enjoyed the thought that I was going somewhere, that I was back on the road. Well, rails, but you get the point. As the train travelled across the English countryside, I read from Will Ferguson’s Hokkaido Highway Blues, where the author hitchhikes from the southern tip to the northern tip of Japan. A few quotes jumped out at me. It got me wondering if perhaps 10 years of consulting and travelling has taken me to a place where I can’t be happy with a home base, that I must constantly set off in pursuit of the never-ending present, and when all is said and done, is it nothing but a series of vignettes that resemble a coherent story, but really aren’t anything more than snapshots? I mulled it over for a moment, but didn’t come up with any answer. All I knew was that I was happy to be in motion, that all the doom and gloom about the economy that I had watched, perhaps too intently, all week had fallen off me, leaving me smiling and happy. And that was a good thing. An hour and a half after leaving London, the train arrived at Dover Priory rail station. With a name like Dover Priory, I expected that the train would pull up into a chamber underneath a baroque cathedral, but the train station is just a regular looking train station, with 3 platforms and a small station house. No friars or nuns in sight. In a small bit of advanced planning, I had memorized directions from the train station to the B&B I was staying at. Turn left out of the station, walk along the road until you get to Masion Dieu Road, and than turn right. Then, in a small bit of sabotage against my advanced planning, I didn’t follow those directions. It was for a good cause, though. 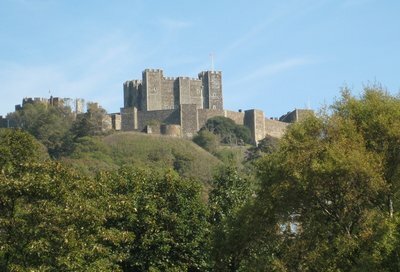 High up on the cliffs above Dover stands a castle, parts of which dates back to 1180. Arriving just after noon, the sun was high in the sky and casting its light on the castle walls, lighting it up. It was an impressive sight, and so I cut through a park to get a better look. After checking out the view, I continued to head towards Maison Dieu Road. Cutting through the park for the castle view had put me a couple streets further south than my memorized directions, so upon reaching Maison Dieu, I wasn’t sure if I should turn right or left. I choose right. Luckily Dover isn’t too big a town, so once Masion Dieu turned into Woolcomber and appeared to dead end, I knew I had chosen incorrectly, and backtracked to find the Penny Farthing Guest House. I was greeted at the door by co-proprietor Annette, who was impressed by my promptness. When booking the place on-line, I had put an arrival time of 12:30. I looked at my watch. 12:30 on the dot. Good thing I took that wrong turn, otherwise I would have showed up 3 minutes too early. As Annette showed me up the stairs, she gave me a tour while continuing discussing people who show up at times other than when they said they would. “That’s the dining room. So many people say they will be here at noon, but then show up at 3. That’s your bathroom. ‘Oh, we decided to grab lunch,’ they will say. This is your room. Here’s the key. Because I have to be here when they arrive, it can really throw off my schedule when they don’t show up. Here’s some clean towels, and your shower is right here. That’s the problem with the internet bookings, you never talk to the person on the phone to work out things. Breakfast, if you want it, is £4 and is served from seven until quarter to nine. No pressure, either way. Let me know later tonight if you want it,” and with that she was away, leaving me to examine my room. It was a nice room, with a single, comfy bed, a sink, a museum piece of a TV set and a shower. The toilet was down the hall, though was my “private” toilet as all the other rooms had their own toilets, or so I think. The room had tall ceilings, and with that came a massive window looking out onto Maison Dieu road. Room examined, I dumped my bag and headed out to see the White Cliffs. On the way out, I ran into Annette again. “What brings you to Dover? Here to see the white cliffs?” she asked. “Yes, I live in London and thought it would be...” I said, but didn’t finish my sentence as Annette started speaking again. “As you are on foot, I think the best thing for you to do is go the long way to the cliffs. The main road just has a thing strip of pavement and the cars go along so fast. I really think its quite dangerous. What you want to do is walk out of the house and turn left, then when the road ends, turn left again. Keep to your left when the road forks, and you’ll come to a set of stairs. Once at the top of those, just start walking,” she said, finishing with a smile. “Thanks,” I said. I walked out of the house, turned left and, for the second time that day, ignored the directions I had and turned right. Again it was for a good cause, this time it was to get some money, as I only had £3 on me, and to get some lunch. I walked to the Market Square. 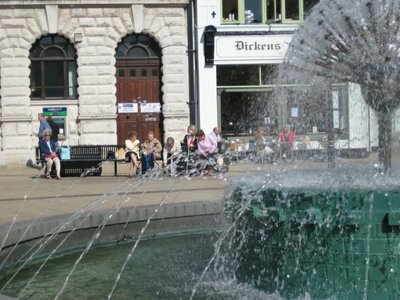 The day was beautiful, sunny and warm, and many folks were sitting on the benches of the square, soaking up the sun. I took out some cash and surveyed the scene. A pedestrian mall ran north from the Square and seemed to have restaurants on it, but that was the opposite direction that I wanted to go, so instead I headed South towards the water, hoping that something would appear that looked like it was serving a good lunch. Unfortunately, my choices to the south were either KFC, Kababs or Pub Snacks, none of which appealed to me. I came out on the waterfront and got my first really good look at the cliffs rising up above the town. 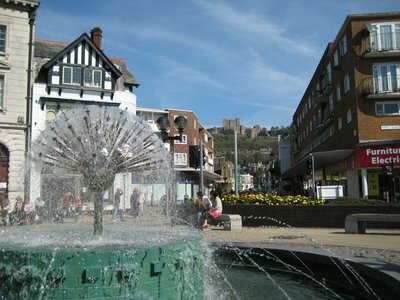 The centre of Dover is in a valley in the cliffs, making it a natural port. To the East and the West though the cliffs tower up above the water. I found the stairs leading up that Annette had mentioned without finding any food, but decided to press ahead, hoping that perhaps there was a snack bar along the way. Failing that, I knew that the next town was only 5 miles away. I could probably make it that far without anything in my belly. Failing that, perhaps I could catch and eat a seagull. I was sure I’d figure something out. Walking up the path I got my first close look at the cliffs. 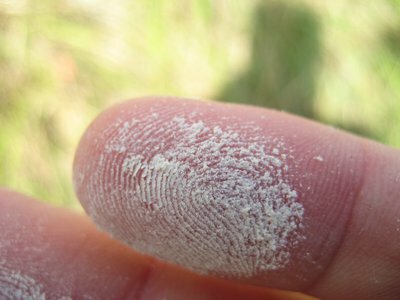 I ran my finger along the cliff face, and it came away covered with white chalk dust. “Just like back in school,” I thought. Nowadays, I am sure that kids in school use whiteboards and dry erase markers, or electronic presentation boards or maybe even some manner of technology where they text their answers to the front of the class, but back when I was in school we had black boards and white chalk. Chalk always seemed to break into pieces when you tried to write with it. It seemed so frail. I looked up at the cliff face rising above me, and wondered how often chunks of frail chalk came falling down. Often, it turns out. 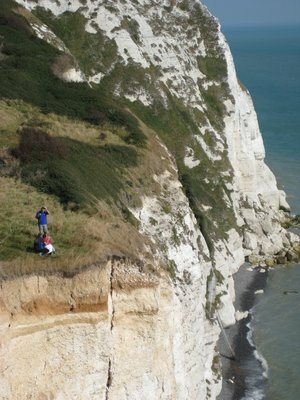 The cliffs recede about 2 to 5 cm a year, and large fractures can cause up to a metre of cliff face to careen down into the ocean at a single time. 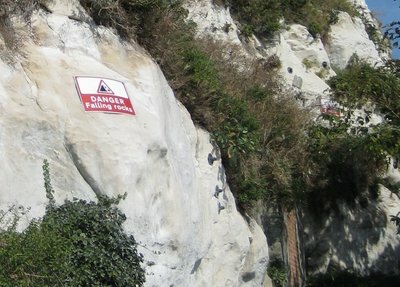 In fact, visitors are warned to stay a few metres back from the cliff face just in case. Actually, visitors aren’t warned. Some visitors, those that read the correct brochure are warned. The rest of us only find out about these warning post trip when researching about the cliffs online for our blogs. While chalk is frail, it is also very hard, which anyone who has been hit in the head by a flying piece of chalk can attest to. How a substance can crumble in one case and become rock hard in the other is a mystery to science, and if I recall correctly it is one of the main discoveries that scientists working at the Large Hadron Collider in Switzerland are hoping to unravel. Thinking of this dual property of chalk while reading the BEWARE OF FALLING ROCKS sign, and decided that I didn’t want a big chunk of Dover chalk hitting me in the head. I imagine that it would probably hurt exponentially more than a small piece of blackboard chalk. 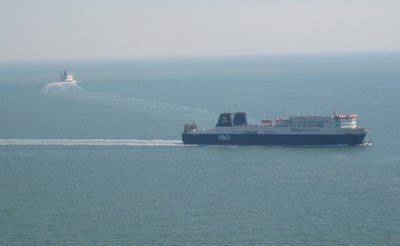 I was on a ridge that climbed up towards the top of the cliff, with excellent views of the ferry port. 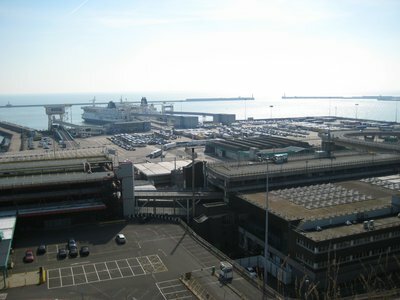 From Dover, ferries from four different companies power off to Calais, Boulogne and Dunkerque, taking cars, trucks, buses and foot passengers. I could see why my flatmate’s friend had said the Dover was industrial feeling. With all the lorries queuing on the massive blacktop, waiting to board a ferry, it certainly has a certain commercial and functional feel to it. I however, liked it for just that reason. I have always liked boats, much like I like trains, and enjoyed watching the ferries pull in and out of the port, loading and unloading endless streams of vehicles. I wasn’t alone, either. As I walked along a number of folks were set up along the ridge, binoculars in hand as they watched the coming and going of the big boats. Here in England they call people like that anoraks. An anorak is a type of parka with a hood, usually fur lined. The coat is favoured by trainspotters, those hardy types that stand outside in the rain and cold and watch trains go by. For most people, trainspotting seems a rather pointless activity, and listening to a trainspotter go on and on about it invokes a similar feeling to a root canal. Thus, the trainspotters wearing anoraks lead to the slang term being applied to anyone with a arcane, dull hobby like watching trains, playing with ham radios or parading around in old Austin Minis. I, of course, am not an anorak because I don’t know arcane facts about trains and boats. I just like to watch them. See, I’m not a nerd. I just proved it. QED. Reaching the top of the cliff, my stomach was grumbling unhappily, so I was pleased to see a visitor information centre with a cafe. I went in and ordered a egg salad sandwich. It was excellent, with tasty chunks of egg in mayonnaise and soft, fluffy white bread. For some reason though, the crusts were tough like leather. They, like the rest of the sandwich were very tasty, but it required some serious gnawing to get through the crust. Sated and with a new found energy, I set off from the visitor centre and along the cliffs. There was a multitude of paths, but I tried to stick as best I could to the paths closet to the cliff face. Unfortunately, this meant a number of times I found myself at a dead end where ridges suddenly ended. I found myself more than a few times having to scramble up and down steep hills or performing some manner of parcour that would have been best left to a younger man. I noticed in my scrambles that it is much easier to climb up than it is to climb down. By this I mean that climbing seems to require nothing but physical effort, whereas climbing down requires a lot of mental and emotional effort. I would find myself at the top of a steep hill, looking down at a 45 degree angle and feel fear gripping at me. I would have to take a couple of deep breaths before starting my descent. I have a theory why this is. Actually two theories, but I could see them working in concert. First is one of focus. When climbing up, you are looking up. Looking up isn’t scary. No one has ever died from falling up. In fact, falling up would probably be flying, which would be cool. People dream happy dreams about flying. When climbing down, you are looking down. People die from falling down. Falling down is painful. Throughout your downward climb, you are always looking down, towards a possible death. That’s scary. The second theory is that gravity actually makes climbing up easier, or rather makes it more controlled. When climbing up, gravity is working in the opposite direction. You have to overcome it, which means your actions are all slow and deliberate. When climbing down, gravity is pulling you in the same direction you are travelling. It is easy to start moving too fast, to lose control and end up careening down a steep hill towards a cliff face. Climbing up is all about deliberate and slow movements to defeat gravity. Climbing down is all about trying to maintain control so you don’t die. All that means that I am no longer impressed with people that climb up mountains and then repel down. They are skipping over the hard part. From now on, if you wish to impress me, you will repel up the mountain and climb down. The weather was warm and the sun was shining, but atop the cliff the wind was blowing strong. Taking advantage, two women were flying a kite. The girl controlling the strings was a thin brunette with a bright smile. I watched her for a moment, and she reminded me of a girl I had met while travelling in South America. Our routes had crossed for a few days, and soon I found myself smitten with her. Like everyone else you meet on the road and travel with for a few moments, eventually your paths diverge. We exchanged email addresses and kept in touch for a bit, but eventually the emails stopped, and I added another person to the tally of people I met and lost touch with. The older I get, the more people seem to join that list. I walked along, thinking of people I had met on the road who I had lost touch with. Especially the women, my crushes, infatuations and dates who I shared time with and who all I have now are fuzzy memories. Seeing the girl with the kite brought the song “Kite,” by U2 into my head. The song played in my head, providing a soundtrack to the mental slideshow of the many girls who had come and gone in my life. 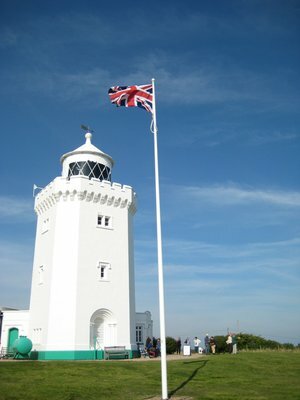 About 20 minutes later, with images of all the girls I’ve loved before, who’ve travelled in and out my door still rotating in my head, I came to the South Foreland Lighthouse. The lighthouse, built in the 1840s, warned ships of a nearby sand bank until it was taken out of service in 1988. Presumably there is still some warning of the sand bank and its not that people just stopped caring about shipwrecks. The lighthouse has a place in both electrical and telecommunications history. The lighthouse was the first to have an electric light thanks to Michael Faraday, and it was the first place to receive a ship-to-shore transmission in 1899 when Guglielmo Marconi was working with radio waves. Most people turn around at the Lighthouse and walk back to the parking lot of a the visitors centre, completing a 4 mile walk. I, however, knowing that I had an additional mile to get back to Dover on foot and feeling thirsty, decided to keep walking towards Saint Margaret’s Bay, which was only 1 mile away and offered the promise of food and drink. Saint Margaret’s Bay is another place where cliffs dip down and provide access to the water. A rocky beach provides access to the chilly waters of the English Channel for those daring soles who dare enter the water. Not feeling daring, nor having a swimsuit, I settled for a pint and some peanuts at the Coastguard Pub and Restaurant. Settling onto the patio with my pint of Seasider Amber Ale, I looked out over the water towards France. The Coastguard claims to be the closest English pub to France. With only 22 miles of water between it and the coast of Calais, that is probably a true claim. In fact, I could see France. Looking at the horizon, between the hazy blue-green of the water and the hazy blue-grey of the sky there was a thin strip of hazy grey-brown with a few speckles of hazy grey-white. That thin strip was France. I finished off my pint and bag of peanuts, and debated about another pint but decided against it. I had 4 miles to put behind me before I would be back at my hotel, and I was afraid another pint would just make me sleepy. So I set off again, buoyed by the calories of protein and carbs from the beer and peanuts. I climbed out of St. Margaret’s Bay and back up atop the cliffs. 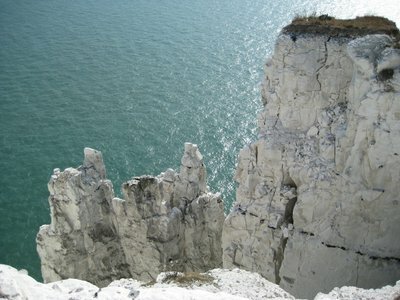 Continued in White Cliffs Part II: Chalk Dust On My Jeans. Lovely shots of the cliffs Greg. They are a thing of real beauty. I can remember hanging off the back of the passenger ferry to Calais watching them fade into the distance. Enjoyed your blog entry. I hadn't realised you had moved to London to live. All the best - I hope it works out for you. London is a good city.